Arigna Natural Gardens » New Soft Fruit Area. Recently we have added a new soft fruit area to our garden. This area was always a sort of waste area that had a ramshackle fuel shed. We have now got rid of the shed, put up a new fence, added stone edging and dug the whole area over. It has been planted with loganberries, blackcurrants and gooseberries. When the weather warms up the ground will be mulched with newspaper then straw. This will eventually rot down and fertilise the soil. Comfrey and herbs will be planted through the mulch. The fruit will be frozen and used to make jams throughout the year. We sell our jams at The Post Office in Arigna and at The Bakery & Deli, Priests Lane, Carrick-on-Shannon. We also sell from home. We already have a very productive grapevine and a peach tree in the polytunnel. 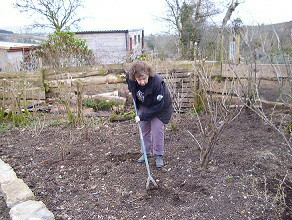 Apples, plums, pears, strawberries, damson and blueberries are also planted around the garden. A course on jam-making will be running here on our smallholding in Arigna throughout the summer months. There will also be courses on salad growing and the growing and usage of culinary herbs. Check our courses page for further details. 1 comment to New Soft Fruit Area.